filters out your comment and track-back spam for you, so you can focus on more important things. So how good is it? Well as far as we have discovered "It Does What It Says On The Cover"! and that means no spam making it onto our blog and we can concentrate on building our site. Akismet was designed and built by the WordPress designers and works great with it. When you set it up you don't have anything else to do, it works away in the back ground and will only report to you if you request it to. 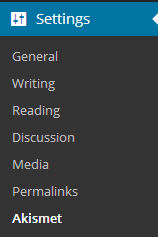 When you want to see what spam you are not getting you just go to your dashboard (www.yoursite.com/wp-admin) and click on settings on the left hand side. This will give you a list of setting options look for the Akismet option and click on it. When you have selected the Akismet option the home page for the Akismet settings will open, at the top is a graph showing the number of spam that it has blocked. Below the graph Akismat lists the number of spams it has blocked in the last 6 months as well as the number for all time. It also tells you the accuracy as a percentage of the spams you have been sent. Below these are the settings and account options. The settings box holds your API key and options related to comments - show the number of approved comments beside the authors name. It also allows you to control the level of strictness that you wish to use in relation to spams. This can be set to - Silently discard the worst and most pervasive spam so I never see it. 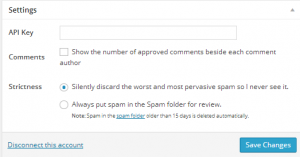 (this is the default setting) or you can set it to - Always put spam in the Spam folder for review. With this option you will have to handle deleting any spam you get. Next to this box are the account details related to the API key. There is an upgrade button to change your account type, if you are using the site for business purposes. Now that you know what it does you need to install and activate it. When you have that done you need to set it up for your site.